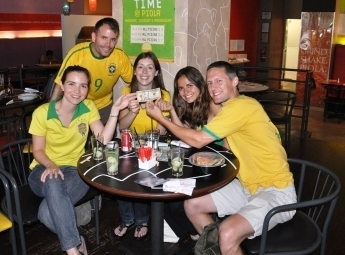 Day 196 – Daniela C, Antonella W., Amina F. and Steve L.
I met Ryan and Mandy, my brother and sister-in-law, to watch the Brazil – Chile match at a restaurant called Piola in Arlington. Despite it’s origins in Treviso, Italy, I always think about Piola as a Brazilian Pizzeria. When I lived in Brazil there were several Piolas. I used to go to one in Jardins neighborhood quite often. 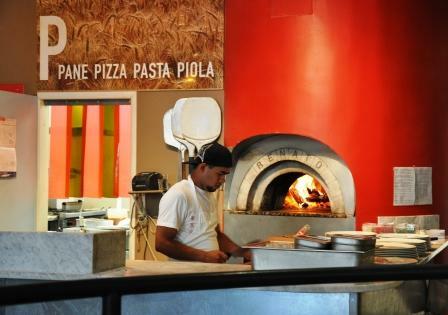 Brazil has great pizza and although Piola is good, it’s not the best there. For me the best pizzerias in Sao Paulo are Speranza, 1900 and Braz. Anyway, for the options we have here in the DC area, Piola makes a good pie. 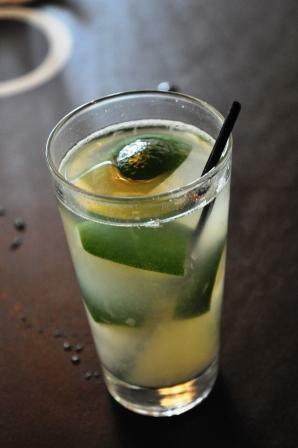 When they opened up a few years ago in Arlington, I noticed a lot of Brazilians working and dining there. So, that is how we ended up watching the Brazil game there. There were not that many people at the restaurant watching the game. Granted it was being played at 2:30pm on a Monday, so perhaps people were at work. Of the handful of fans there cheering on the game, most were clad in Brazilian shirts like myself. When the satellite connection failed for nearly a half hour due to a thunder-storm, the table next to us pulled out their laptops, connected to a WiFi network and continued watching the game. I migrated over to their table to watch the game and discovered that three of the four of them were from Brazil. I decided to give them my $10 for the day! The game ended with Brazil eliminating Chile’s participation in the World Cup by a score of 3-0. Although everyone in the bar was celebrating, part of me felt a little sad for Cecilia from Day 151. As the game came to a close and people started to rush back to work, I tried to quickly take some notes about my new friends. Unfortunately Steve had to leave immediately and the others only had a few minutes before they too had to leave too, so I had to work fast. I asked them what they thought of Washington. “I love DC,” says Daniela, “Rio is not as safe as Washington. This is a very safe, cultured, cosmopolitan city.” Antonella agrees and adds that “Sao Paulo’s traffic is crazy!” She’s right about that. I don’t miss the traffic in Sao Paulo at all. As I was furiously writing down notes in my Moleskine notebook, I heard somebody else say, “We’re in the most important place in the US.” It’s positive to hear them say such nice things about DC. I loved my three years in their country too! The conversation shifts to what they plan to do with the $10. I was very impressed by how they approached this opportunity. After a good five or ten minutes of back and forth discussion amongst themselves in Portuguese they told me that they had decided. “We’re going to pick a random address in the phone book and send the $10 to them with a note explaining about your project.” That was pretty cool. Nobody has done that before! “And if they don’t want to keep it we’re going to tell them to give it to somebody else.” “Parabens” to them for a creative and thoughtful idea. It’s only fitting that I post this blog entry today as the world watches the final chapter of the 2010 World Cup. Brazil didn’t make it unfortunately. Will it be Spain? Or will it be The Netherlands. Whoever wins, history will be made as neither team has ever won the World Cup. I have to root for Spain having lived there and developed a strong friendship with many Spaniards. I can’t forget Carlos from Day 118 who hails from Spain or the Dutch recipients of the Year of Giving: Pieter from Day 140 and Karel and Maria from Day 200 – look out for their blog posting this week! Note: I am sitting here at home watching the game as I write up this blog entry. It’s 0-0 in the first over-time period. Viva España! Day 63 – Moe M.
I met Moe on Monday evening. My cousin Cheryl and I hailed a cab in DC to take us over to Rosslyn, VA to meet with my brother, sister-in-law, and friends Conor and Scott. We were meeting them at Piola, a good pizza joint that I was first introduced to in Buenos Aires in the late 90s. Later, I ate at Piola in Sao Paulo. About a year ago, Piola opened up here in DC. In an age where pizza seems to be getting so processed and tasteless, Piola is a little bit of hope. Even the pizza they make here is not as good as the pizzas they serve up in Sao Paulo though…then again, Sao Paulo has some of my favorite pizza in the world. Cheryl and I didn’t talk to Moe much on the drive. We were busy chatting away. When we arrived, Moe said he had to ask a question about what happened at the end of Cheryl’s story. Cheryl explained and we got out of the cab. Normally I would probably think it was rude for the cab driver to be so nosey as to ask something like that, but, not the way Moe asked. He had a real genuine interest. We paid the fare and got out of the cab, Cheryl noticed she was missing one of her rings and looked all over for it. The driver got out and checked around the car, under the seats, everywhere. But it was not to be found. The 58-year-old former real estate executive and father of two twin boys took our contact info and offered to get in touch with us if he found it. I was touched how thoughtful and kind he was and I pulled out my $10. He took it and said he would use it for gas. In all the craziness about the ring, I forgot to get his contact information to invite him to the year end party and maintain contact with him throughout the Year of Giving. So, Moe, if you check this out, drop me a note! By the way, Cheryl found the ring in her hotel room the next morning.